Manually editing images can be a tedious time-consuming task. One of the best new tools to speed up the process is Perfectly Clear 3.0. 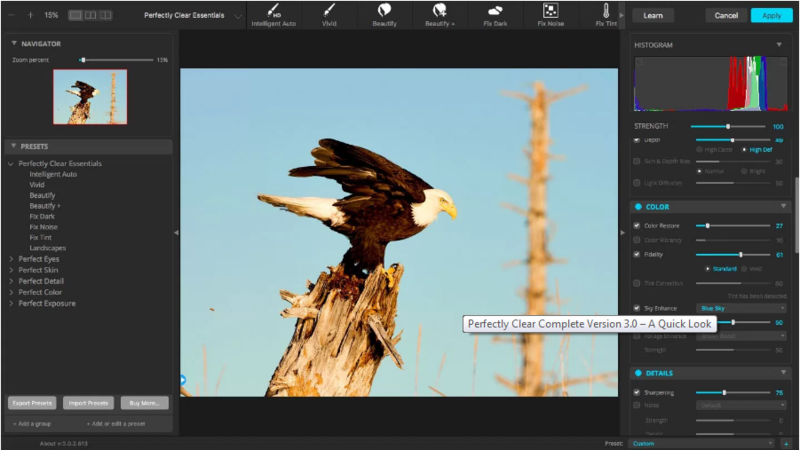 Perfectly Clear 3.0 offers plug-ins for Photo Shop, Lightroom, Elements, and Corel PaintShop Pro. It features presets for common applications, such as Landscapes, Portrait, Noise Removal, Fix Dark, and Tint Removal. Simply allowing the software to “do its thing” often tremendously improves the quality of the image. However, users can use the sliders to manually control noise, contrast, color, etc. and create custom presets. While Perfectly Clear can handle portraits and landscapes, the software really excels at removing red eye, hiding blemishes, and correcting skin tone. The Beautify+ preset can also remove dark circles, whiten teeth, and slim the face. Even with so many adjustments, the results look natural. According to Athentech, automatic correction uses advanced facial detection techniques to identify age, gender and key facial features when making the correction. Perfectly Clear 3.0 can dramatically improve image quality with minimal efforts. The image correction technology can make up to 20 auto corrections with one click. It can also batch process thousands of images in minutes. However, it’s not perfect. Despite improvements in the latest version, the user interface could still be more responsive and streamlined. Professional photographers will likely find that Perfectly Clear 3.0 does not yet match the power and ease of use of DxO Optics Pro. For photographers who like to “try before they buy,” Perfectly Clear also offers a free 30-day trial. It currently retails for $129. You can also purchase less expensive software that edits certain aspects of your photos. For instance, Perfect Skin sells for $59 and Perfect Eyes sells for $49.